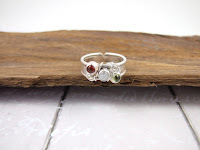 Hello, well here we are in the middle of autumn and almost at the end of the year, just two more months of gemstones to come. 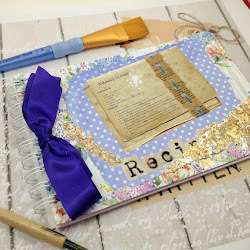 I'm just starting to think about what to write about next year, maybe better not to plan a regular monthly blog as that didn't quite work out this year, but I will be doing something as regularly as I can. I have just started to work with metal clay so I'm thinking maybe next year will be about that as I develop new skills in working with clay and a kiln, there's also lots of other things I want to try in my kiln including glass and enamel so plenty to write about in the future. Right, back to gemstones for October. My research this month didn't actually turn up that many stones associated with October. The main ones are Opal and Tourmaline, but there's also Rutile Quartz. Opal is most definitely a staple stone in my gem stash, there are several varieties including Australian Opal, Honey Opal, Seascape Opal, Peruvian Opal, Ethiopian Opal and Fire Opal. Opals are said to inspire and boost your creativity. It is sometimes thought of as an unlucky stone. I remember my Nan saying that Opals can bring bad luck, maybe this is because it's considered to be a karmic stone that can help you see you whatever you give out has a way of coming back to you, making it a good stone for reflection. 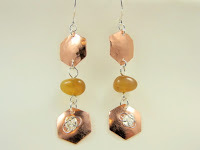 Honey Opal paired with copper hexagons and a little silver wire work bee earrings. 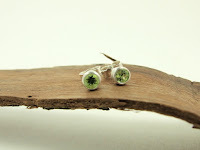 Tourmaline is a stone that comes in a variety of colours, including the pretty watermelon, not a stone I have used yet, though I have used the deep purple variety in these Celestial Moon and Stars Birthstone Earrings. 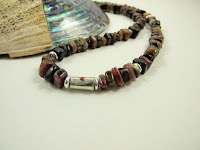 This necklace ia made from tourmaline in lovely warm earthy tones, perfect for autumn. 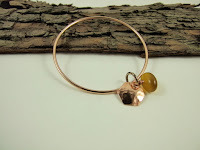 Last but not least on the list is Rutile Quartz, said to be a good healing stone that enhances your awareness. I have yet to make anything with this stone, but I have just added a rather lovely Rutile Pear cabachon to my stash just waiting for the perfect setting, so I'm sure it will pop up in a make soon. Well that's it for Gemstones for October, thanks for stopping by and I'll be back in a few weeks with some Gemstones for November. Oh dear all my best laid plans to come back in August got lost somewhere between my birthday, a tummy bug and a water infection! plus I've been super busy in the shop with orders and distracted by my new kiln. For my Birthday I went on a silver clay course and absolutely loved it! 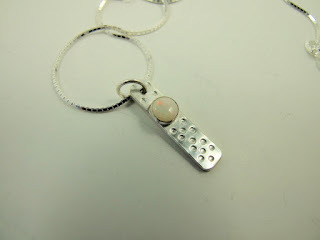 so as well as gemstones for August and September I can show one of my new makes using silver clay. 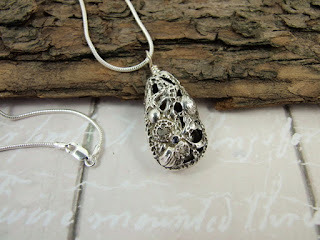 I'll be blogging about silver clay later on this year. Okay so lets start with August, being my birth month I was keen to learn more about the stones that were associated with August. First there's the obvious Peridot, which I really do love for it's delicate apple green colour. whilst the smooth cabachon in the ring gives a different look to the stone. Another favourite for August is Sardonyx, which is from the chalcedony group of stones. Typically sardonyx is sand coloured often with bands of apricot or brown. 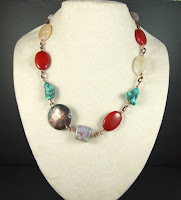 The Sardonyx beads I have used in this necklace are more towards the apricot shades. Other stones for August include Kyanite, Peacock Ore, Diopside, Rhodochrosite and Amazonite. Amazonite is another favourrite for me, I love the delicate milky blue-green tones of this stone. 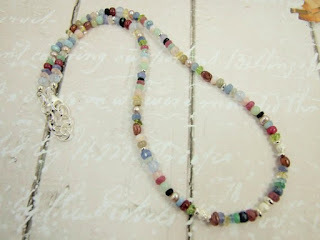 This Mala necklace is a combination of pale baby blue Amazonite and soft blue green amazonite, paired with turquoise. Amazonite is often used for meditation for strength and self identity. Kynite is another stone I use, I love the duck egg blue tones, I have several pieces of raw kyanite that I plan to use, I'm just waiting for the right inspiration. Moving on to September and is all about Sapphires, ranging from the deepest blue to bright pink. It is one of the hardest stones next to diamonds. 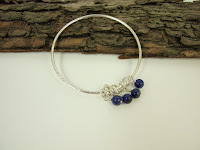 I use a lot of sapphires in jewellery making, including both beads and faceted cut stones. 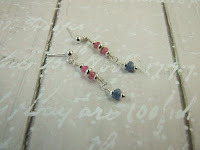 These earrings have both blue and pink sapphires. 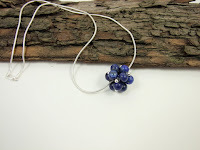 I have discovered recently I can fire sapphires in my kiln with silver clay. 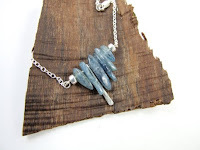 This is one of my new silver clay necklaces, set with a gorgeous faceted blue sapphire alongside a rough grey diamond, both perfect for the seaside theme. The only other stone I discovered associated with September is the beautiful Lapis Lazuli, a firm favourite of mine that you will see used regularly in my work. I adore the rich blue tones with just a smattering of gold (pyrite) in these stones. I love working with Lapis Lazuli not least because every time I work with it I am transported back to Cairo and the wonderful memory and emotions of a visit to the museum and just gazing at the delicate and beautial Mask of Tutankhamun, an experience I treasure and will never forget. So that's it for August and September, thanks for stopping by and I'll be back soon with a showcase of gemstone for October. 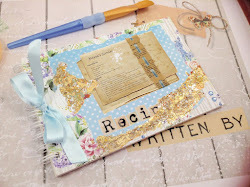 A crafty Welsh Mam. Hand Crafted Artisan Design Jewellery & Artist.